All of the events around Colorado and Denver to help celebrate the Jewish holiday of Hanukkah (or Chanukah). The eight-day Jewish celebration of Hanukkah begins on the evening of Sunday, Dec. 2 this year. Also known as the Festival of Lights, Hanukkah commemorates the rededication of the Second Temple in Jerusalem when Jews rose up against their Greek-Syrian rulers in the Maccabean Revolt. MORE | When is Hanukkah and what does it celebrate? Sunday, Dec. 2, 10 a.m. - 12 p.m. This event will include a concert, Hanukkah-themed arts and crafts, a Menorah lighting, dreidel games, a tumbling area for kids and kosher food. It is $12 for adults and $10 for children. Sunday, Dec. 2, 1 p.m. - 4:30 p.m. Participants will meet at the JOI house to make Hanukkah cards and decorations for senior citizens living at Shalom Park. Then, at 3 p.m., the group will head over to the senior care facility to host a Hanukkah party and hand out the cards and decorations. Sunday, Dec. 2, 3 p.m. - 5 p.m. The centerpiece of this family-friendly celebration will be a massive 600-pound ice Menorah that will be lit at sundown. There will also be an indoor amusement park, ice skating and Jewish treats. Tickets are $10 in advance and $15 at the door. Sunday, Dec. 2, 3:30 p.m. - 5:30 p.m. Kids and adults can go ice skating with Minnie and Mickey Mouse at this unique event. There will also be opportunities for pictures with other Disney characters, snack, music and a Menorah lighting. Sunday, Dec. 2, 5:30 p.m. - 8 p.m. This annual competition pits some of the best chefs against one another to create the best traditional and creative latkes. After the competition, there will be a concert and Menorah lighting. Monday, Dec. 3, 5 p.m. This celebration will include a giant Menorah lighting along with music, latkes, donuts, dreidels and more. There will also be a special appearance by CSU President Tony Frank. Monday, Dec. 3, 5:30 p.m. The Colorado Hebrew Chorale will be performing a program of holiday music at Kavod Senior Life. The event is free and open to the public. Tuesday, Dec. 4, 4:30 p.m. - 5:30 p.m. The Grand Car Menorah Parade will begin at the Shops at Northfield at 4:30 p.m. and end at the 29th Ave Town Center. Then, beginning at 5:30 p.m. at the Town Center there will be snacks, hot cocoa, a fire performance and the community Menorah lighting. Tuesday, Dec. 4, 5:30 p.m. This celebration will include a giant Menorah lighting along with music, latkes, donuts, dreidels and more. There will also be a special appearance by Mayor Todd Jirsa. Wednesday, Dec. 5, 5:15 p.m. - 6:30 p.m.
For the fifth year, Jewish in the City is hosting this community event and Menorah lighting. Those who attend can expect a fire show, BBQ, a live DJ, donuts, chocolate coins, cotton candy and more. Mayor Michael B. Hancock and other government officials will also be in attendance. Wednesday, Dec. 5, 5:30 p.m. This celebration will include a giant Menorah lighting along with music, latkes, donuts, dreidels and more. There will also be a special appearance by Mayor John Gates. 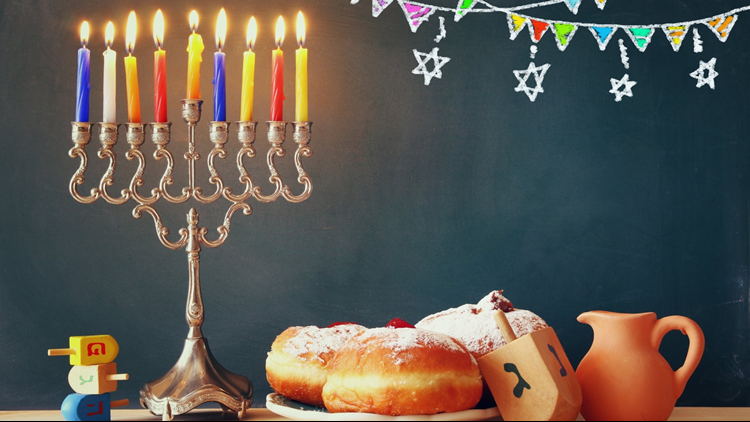 Wednesday, Dec. 5, 5:30 p.m. - 7:30 p.m.
For the fourth day of Hanukkah, this Denver synagogue is celebrating with a candle lighting, vegetarian chili bar, latke bar, cookie decorating, crafts for children and live music. Tickets are $10 per person or $25 per family. This celebration will include a giant Menorah lighting along with music, latkes, donuts, dreidels and more. There will also be a special appearance by Mayor Jacki Marsh. Thursday, Dec. 6, 5:30 p.m. - 7:30 p.m. The Jewish Outreach Initiative is hosting a high-flying Hanukkah celebration at a massive Aurora Trampoline Park. There will be trampolines, dodgeball, dunk hoops, slack lines, zip-lines, parkour, foam pits and an aerial Ninja Warrior-style obstacle course. Tickets are $10 per person. Thursday, Dec. 6, 7 p.m. - 10 p.m.
Young adults in Denver are invited to attend this Hanukkah celebration with a twist. There will be unlimited latkes and donuts along with other appetizers, upscale cocktails and a live DJ. Plus, attendees can participate in a Texas Dreidel tournament with a $100 grand prices. Tickets are currently $25 but may go up. Saturday, Dec. 8, 5 p.m. - 8 p.m. This "magic and mystical" night begins with a happy hour and music. Then, attendees can enjoy a full dinner that includes a latke bar while enjoying circus-style entertainment. Tickets are $8-15 per person or $36-40 per family. Saturday, Dec. 8, 5:30 p.m. - 8:30 p.m. Kids who attend this festival can learn how to make chocolate coins with a professional chocolatier. There will also be music, Israeli games, candle lighting a pot-luck style dinner. Tickets are $20 per family. Sunday, Dec. 9, 9:30 a.m. - 11:30 a.m. The BHM-BJ preschool in Denver will be hosting their Dreidels and Donuts Hanukkah party featuring a recital, classroom art auction and brunch. Tickets are $5 - $20. All funds raised at the event go toward helping the preschool build a new playground. This celebration will include a giant Menorah lighting along with music, latkes, donuts, dreidels and more. There will also be a special appearance by Mayor Wade Troxell. Sunday, Dec. 9, 5 p.m. - 7 p.m. The Jewish Life Center in Stapleton is hosting a very hip Hanukkah celebration to mark the end of the holiday at the Stanley Marketplace. There will hot latkes, a gelt toss, crafts, make-your-own donuts, a canned food drive, an olive oil press and a giant "Can-orah". Sunday, Dec. 9, 6 p.m. - 9 p.m. This community concert features Cantor Martin Goldstein and his daughter Shilo Gold, who appeared on The Voice, as well as other local musicians. The concert will also be preceded by a candle lighting.